Regional airline giant SkyWest will sell its money-losing subsidiary to a new joint venture that is part-owned by the No. 3 U.S. airline. Back in 2010, SkyWest (NASDAQ:SKYW) acquired fellow regional airline ExpressJet in an attempt to gain scale and wring out efficiencies. The deal solidified SkyWest's position as the dominant regional airline company in the U.S. However, the expected synergies never followed. ExpressJet has been a constant financial drain on its new parent company. On Tuesday, SkyWest announced that it had reached a deal to sell ExpressJet to a new joint venture partly owned by United Continental (NASDAQ:UAL). Unloading this money-losing unit could help SkyWest stock resume a multiyear rally that saw it climb from single-digit territory in late 2014 to a peak of more than $60 earlier this year. SkyWest Stock Performance, data by YCharts. SkyWest acquired ExpressJet with the intention of merging it with Atlantic Southeast Airlines, its existing unionized subsidiary. The integration process itself went smoothly enough. Yet the combined operation never reached profitability. By 2013, ExpressJet's reliance on flying 50-seat jets had turned into a huge liability. A U.S. pilot shortage and new rules regarding pilot rest led to big increases in pilot costs, while maintenance expenses for the carrier's aging 50-seat jet fleet began to rise rapidly. Meanwhile, ExpressJet's major airline partners weren't willing to pay high enough rates to cover those expenses when 50-seat jets typically lack the first-class and extra-legroom seating that drives a substantial proportion of the legacy carriers' profits. As a result, ExpressJet's segment loss ballooned from around $18 million in 2012 to $49 million in 2013 and $100 million in 2014 (excluding special items). Profitability -- again excluding special items -- has improved since then due to SkyWest's restructuring efforts, but ExpressJet has continued to lose money consistently. ExpressJet will operate regional flights exclusively for United by mid-2019. Image source: United Airlines. A potential deal to sell ExpressJet to United Airlines has been percolating for about a year. It's not a coincidence that ExpressJet recently stopped flying for Delta Air Lines and has firm plans to wind down its flying for American Airlines in early 2019. SkyWest was already transitioning ExpressJet from a strategy of opportunistically placing regional jets with various airlines to its new role as a dedicated regional airline for United. For United Airlines, buying a stake in ExpressJet makes sense from a strategic perspective. With the option of using an in-house regional airline, United will have more negotiating leverage with the third-party regional carriers that it uses for most of its regional flying. That's a big reason why all of United's big rivals own regional airlines. The rationale for KAir Enterprises is less clear. However, it's possible that SkyWest is selling ExpressJet at a substantial discount to book value and that KAir Enterprises thinks it can capture that extra value by carefully managing the airline. SkyWest stock has pulled back sharply in the past few months, even though analysts' earnings estimates have continued rising. As a result, the stock now trades for just nine times the 2018 analyst consensus for earnings per share. The sale of ExpressJet will by itself provide a small EPS boost next year, while the proceeds can be used to fund further share buybacks (which will add to SkyWest's EPS growth). To be fair, rising pilot pay and higher maintenance costs for older planes remain meaningful headwinds that could eventually hurt SkyWest's bottom line. However, the company has an impressive track record of offsetting these pressures. 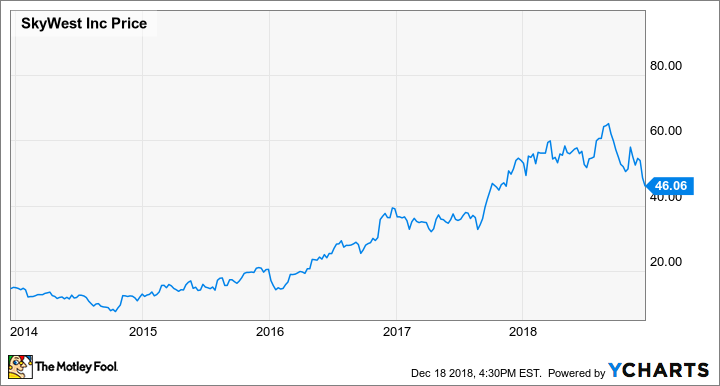 Considering how cheap it is today, SkyWest stock is definitely worth a look for long-term investors.